Fresh Flours Opening, "Irish Matcha"
I wanted to make sure I made it to Fresh Flours on their opening day, so I came for a late breakfast with my roommate. 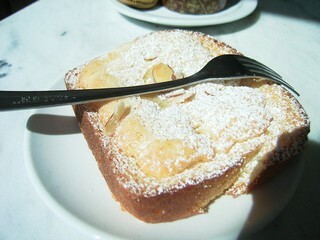 The space was jumping; a steady stream of adventurous joggers, baby-stroller wielding couples, and meandering neighborhood residents flowed through, and decimated most of the available pastry selection in short order. There were a number of tempting things, but I got started with two of the more Japanese-ish fusions, and my roommate chose a sibling of the Almond Brioche Toast I first tried at Essential Bakery, where Keiji (Fresh Flours owner and baker) has previously worked. The cautious use of sugar was a big plus. The fact that this place is in my neighborhood will make it a frequent destination for me… but I better walk there in the future or it will make me fat quickly. I had a morning latte, which was very nice; it’s made with Victrola coffee. 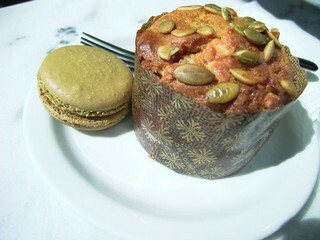 Below: Matcha macaron, kabocha muffin, and almond brioche toast by Fresh Flours. I made a small delivery to complete the order of my new customer, Les Cadeaux Gourmets, in Queen Anne. They have picked up both my dragon beard candy and the Matcha Latte from Three Tree Tea, so I went and helped them with setting up a display stand and I dropped off the second part of their order, which is the Matcha Latte. 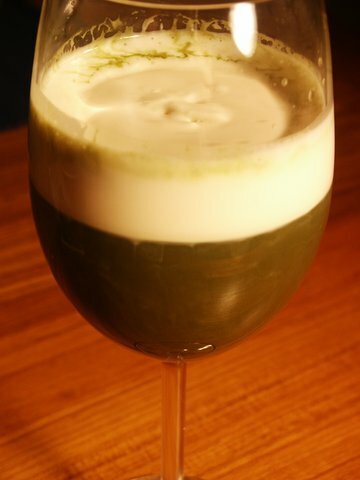 Last night I was playing around a bit and I made my second attempt at an Irish Matcha. When the weather was still cool, it occurred to me that a classic Irish coffee, made with a bit of brown sugar and coffee, then floated with cream, was only a short stretch from my infused gin, and considering that a Matcha Latte works quite well with whole milk, and matcha itself works well with desserts like cheesecake and ice cream. I’ve established that Matcha and gin works well, so I didn’t think it would be too much of a stretch to this. I haven’t yet managed a decent photo, but I wanted to leave at least some visual impression, so here we go. I’m quite fond of this drink, but I think it will be more fun in winter. Boil some water, and pour 4 oz. into measuring cup. Add the 2 tsp. Matcha Latte mix and stir until blended. Pour this matcha blend into a glass. Carefully float cream atop. If, for example, you don’t have the same Matcha Latte mix as I do, try whisking furiously about 1/2 tsp of matcha into the water, then add 1.5 tsp. sugar. For a more Irish effect, use brown sugar. The flavor profile of brown sugar is somewhat similar to kokutou/kurozatou, /Japanese “black sugar”, because of the molasses content, so I would expect that to work fairly well. Last night I mixed about 1/4 cup Matcha Latte mix with a couple of tablespoons of warm water, stirred it a bit, then I added about 3 cups (or roughly 750 ml) of dry gin and shook it up a bit. I will infuse the mixture for about 7 days and then keep it in the freezer. I want to minimize the risk of oxidation and also keep the flavor green-tea like. I’ve made this type of drink once before using about a tablespoon of matcha and maybe 3/4 cup sugar (it was a sweeter drink last time). I usually drank it after dinner served extremely cold, just pulled from the freezer. In that case it was more of a strong liqueur; it had a heady green tea flavor but was sweet enough that it needed to be blended with some shochu or vodka to cut the sugar. I will infuse it for about 7 days. After that I will store it in the freezer to minimize additional oxidation, so that I can keep the color as green as possible. I think it’s discolored a bit since I first made it last night since it was more of a emerald color originally, but a little bit of color change is probably unavoidable. I’m hoping it will make for a nice martini, just shaken and poured into a glass washed with vermouth. The last version of this I made worked for a martini but was more of a digestiv-style drink.